How Do I Place a Single Page Phone Order? 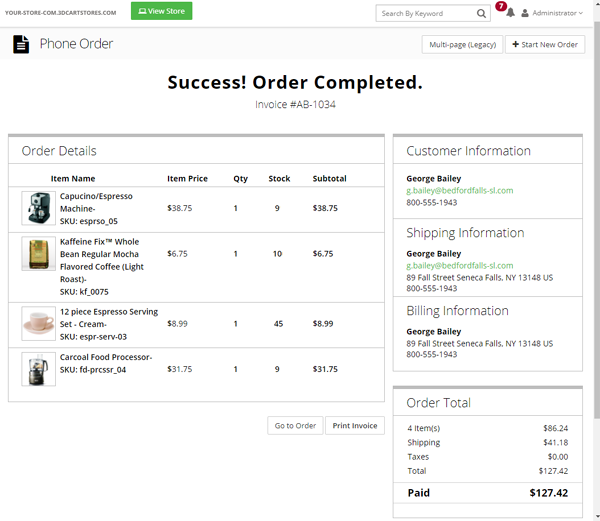 Beginning with version 8.1 of the 3dcart software, you will be able to place phone orders using a single page interface. Once there, look to the top right of the page and click on the "More" button. then select "New Version" from the menu. 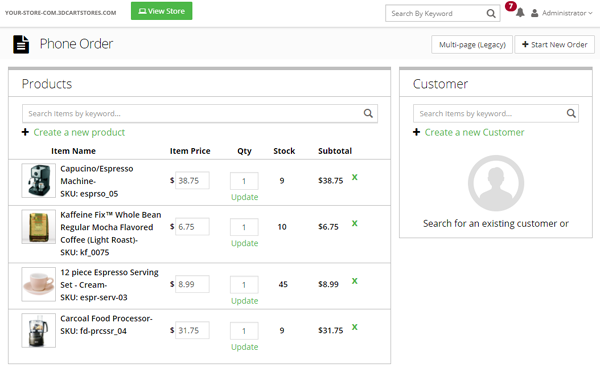 Use the search bar on the left hand section to search for the product(s) that will be purchased. As the items appear, you can click "Add to Cart" (Or "Customize" for product s with options) to add it to the order. If the order is for an item that does not exist on your store's database, you can click on the "Create a new product" link. This will allow you to enter a Name, ID, Weight and Price of the item for the order. Note that this action does not create a full product on the store but rather uses a generic product listing on your store's database. The name, ID, weight and price you specify during this step will only be used on the individual phone order itself. Repeat steps 4 and 5 until all of the desired products are added to the order. If you are using the "Allow Phone Orders Custom Prices" function in your store's settings, you can edit the prices for the products as desired. This setting can be found by going to Settings >General >Store Settings and clicking on the "General" tab. Look under "Other Options" to toggle the setting on or off as needed. 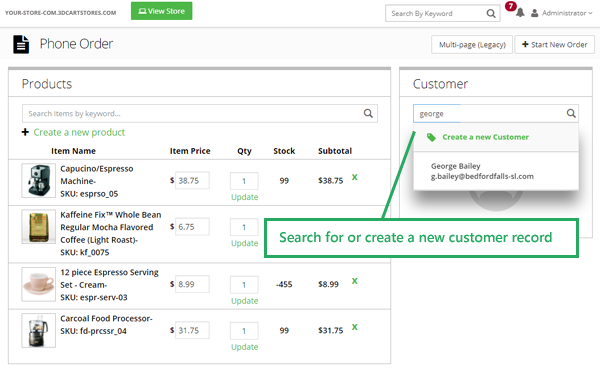 If the phone order is for a brand new customer, click on the "Create a new Customer" link to add the customer to your store's database. Unlike the "Add New Item" link decribed in the previous tip, this action will create a full customer record. 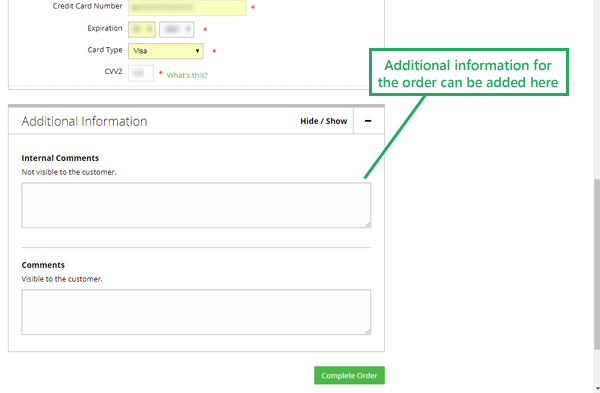 Once you've selected the customer record for the order, their information will be populated along with order totals. This will also open up the sections for selecting the Shipping and Payment options on the order. 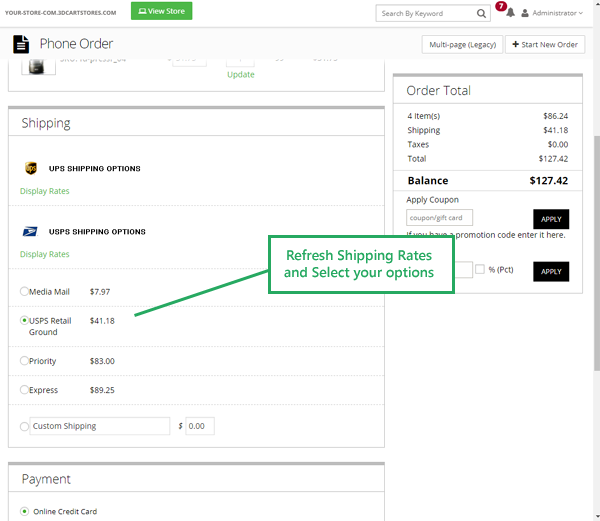 Click on the "refresh shipping rates" button in the Shipping section to calculate shipping for the order. Select the desired shipping option for the order. 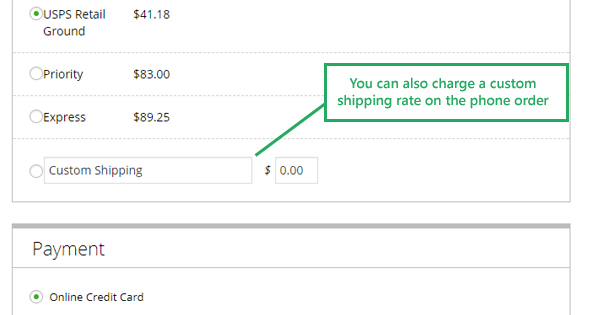 You can also charge a custom shipping rate using the "Custom Shipping" option at the bottom of the shipping section. Additionally, if the order is applicable for Shipping Insurance, you can also select these options as needed. Next, select the payment method options for the order. 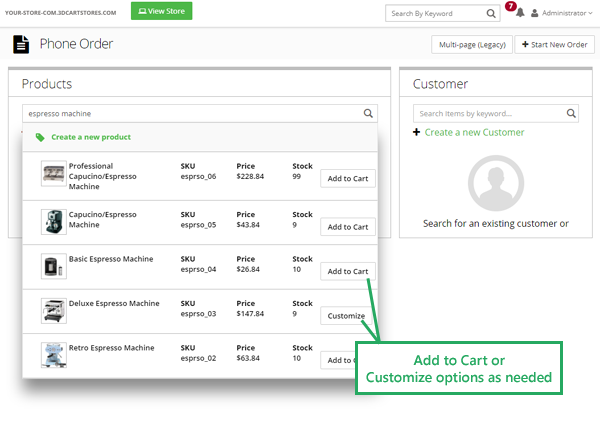 Finally, at the bottom of the page you will see an "Additional Information" section where you can add internal and external comments to the order as well as answer any checkout questions you might have set up on your store. To view this section, click on the "Hide/Show" icon to expand the view. 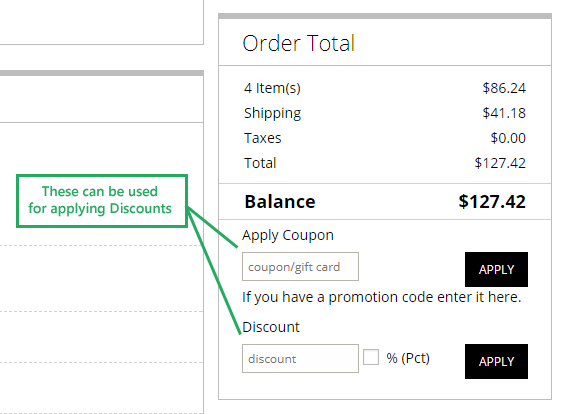 Within the "Order Total" section you will also have the ability to apply discounts to the order as needed. This can be done by either applying a coupon/gift card code on the order, or a discounted dollar or percentage amount of your choosing. Note that the dollar/percentage discount will appear on the order as its own separate line item in the list of items purchased whereas a coupon code discount will appear in the order total sumamry. Once you are ready to finish the order, click on the "Complete Order" button located at the very bottom of the page. 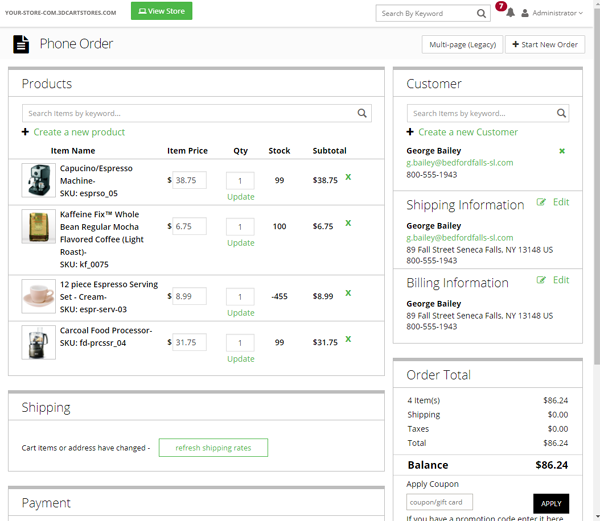 You will be presented with the order summary and link buttons to print the invoice and go to the order in your Online Store Manager to finish processing it.